Most of the companies have started realizing that the consumer base is increasing on day-to-day basis. Most of the sales in the market are done with the help of distribution with multiple intermediaries before the product reaches the store. The IT sales and distribution companies use local as well as distributed solutions with some low commonality processes across the country in which they are operating. This leads to various difficulties like to roll out the best practices, exchange the actionable data and optimize a total cost for the ownership. The cloud based solutions can help in forwarding, standardizing processes, understanding the business capabilities, ensuring better and proper integration of data, lowering the ownership cost, improving transfer time and ensuring scalability and flexibility. Why is cloud used in the IT industry? A cloud based solution is best suited and offers more business benefits as compared to the in-premise solution. 1. The initial software licensing and hardware costs will be prohibitive for the new business models. When taking a cloud based solution these resources are met by the experts and the IT service companies are able to focus more on their business goals. 2. The cost in an IT company is pretty high as they have to walk in line with the technology. This will also help them to work in the same manner for their clients. It also helps in minimizing the capital expenses and optimizes the TCO. 3. The integration issues can be minimized. It is very important that the sales and distribution should be streamlined. The whole process should be automated. It will help in managing the global business with ease with multi features. It should be such a process where in there is complete visibility across the various processes. Ensuring effective lead management so that one can gain the trust of the prospect. This will help in tracking the customer contacts, for the opportunity generation stage for having an efficient engagement with a prospect for a long lasting relationship. It will help you in analyzing the quality of the leads, for the health and the pipeline will ensure which will help you in grabbing the right opportunities at the right time. It will have end to end management activities and enhance the customer acquisition. It is to ensure the customer delights. It will help in maintaining the end-to-end process. It will raise the order that will include the quotation based orders, direct and consignment orders. The pending shipments, shipments for the day and missed delivery date can be tracked easily. All the key information regarding the customer can be maintained very easily. It will help you to track the daily sales, product movement, sales positions and the sales person effectiveness. You can even get the real-time information. It helps to manage and service low as well as the high volume orders with ease and accuracy. Take your business offering to the world. It may include many features like various documentations, invoices, bill of lading details etc. and it is easy to cater to the customers across the globe. Once you sell a solution it’s not over. You would require providing the after sales services to the customers. The complaints laid down by the customer should be solved as early as possible. This will help in establishing a long lasting relationship with the customers. This will help you in providing a customer’s peek in the supply chain. The customers can login and raise their queries, create some orders and follow up on the order status, shipping, billing and payment histories etc. and all that in real time. At the same time you can retain control and manage the access to all the information. The benefits can be reaped if a cloud-based solution is leveraged. The market-readiness and scalability is of prime importance when the cloud is an enabling ability for rolling out and scale it quickly for meeting the demands of the emerging markets business needs. A partner that is taking care for the management for the end-to-end cloud services, so that the focus can be more on the core activities. Cloud also ensures that there is a consistent business process and the capabilities across the markets where the solution is deployed and is critical since there are various distributors who deploy a range of solution and process. There has to be some alignments in the functions and the processes. 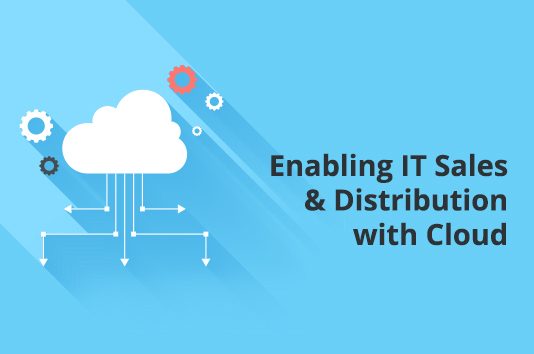 A cloud based solution is like the covering key for the sales and distribution for the business functions that will offer the best fit and slows the cost effective integration with the various stakeholders that have different systems and processes. This solution will need the support of the digital markets, mobile commerce, distributor ERP and distributor data service. It should also connect with the stores and automate the sales force and business intelligence. We at Inspirria Cloudtech, are here to help you. You can take us as your secured cloud provider partner and NetSuite solutions with decade plus of experience working with 450+ Cloud projects. Push productivity to its optimum level with proven solutions, which is used by the best companies all over the world.